Are you trying to get better quality candidates for your available roles? 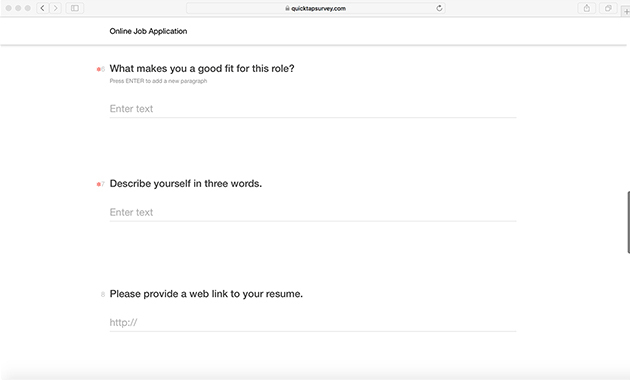 Impress job candidates by creating a beautiful online form application that will look better and work better during the job application process. Improve your response rate and better engage candidates that apply for jobs at your organization. 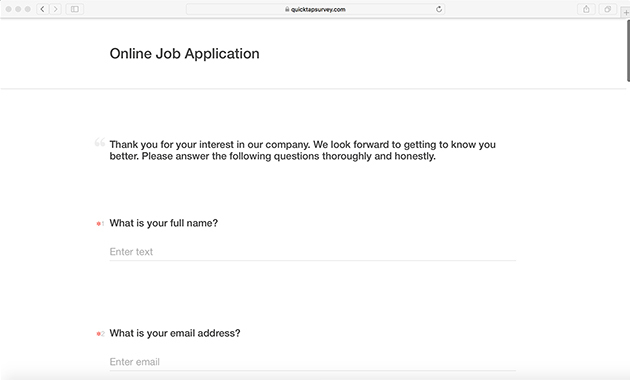 Streamline your recruiting process and avoid a cluttered inbox with this easy-to-use online job application. 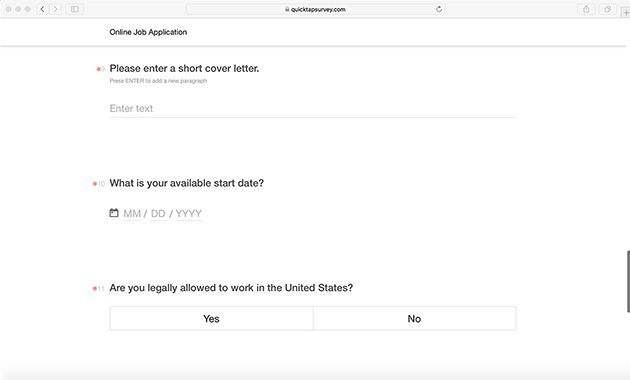 QuickTapSurvey's survey builder app makes it easy to create your own employment application form. 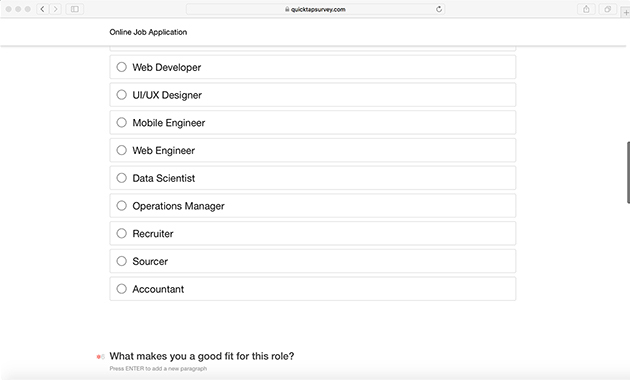 You can start with this great templated example or your can build your own online job application template from scratch using our fast and easy online survey builder. 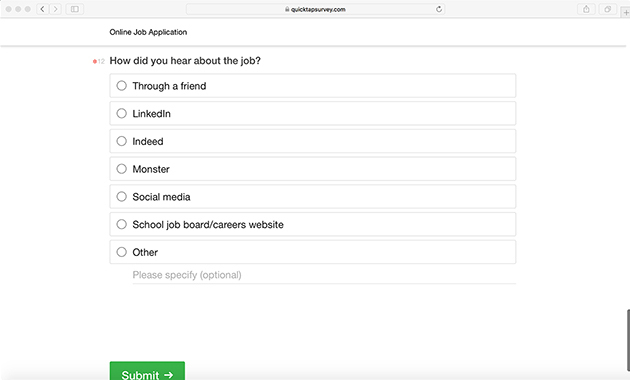 Customize your job application survey with your own questions, and even add your own logo to brand your application form. Tailor the questions and copy to your needs and brand tone. You can even add images and links. In addition to beautiful online survey forms, we also have great offline functionality and the ability to create attractive forms for mobile devices and tablets that you can use to capture data anywhere, even without an internet connection. Find out why we're the #1 survey app, and get started with your own customized job application survey today! Draft a copy of your application questions. 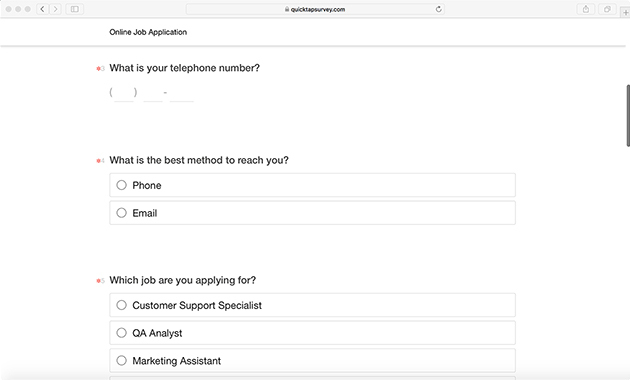 Using our easy online survey builder tool, start with our job application template example and customize it your needs, or build your own application form from scratch. Start collecting responses from applicants through your online employment application form. Analyze and download your job application results and take action with the data.